Here’s a hot new gadget gift that was listed in Neiman-Marcus’ 2005 Christmas Book. Did you miss out on the first airplane? The Model T? Don’t miss out on the 21st century’s soon to be prime(?) mode of transportation. You can have the prototype of an unprecedented mode of transportation - the Moller M400 Skycar - the world’s first personal vertical takeoff and landing (VTOL) aircraft. The M400 has been in development since the 1960’s. This hot new gadget started out looking like a flying saucer - but now it looks more like a cross between a Ferrari and George Jetson’s transportation. This hot new gadget in it’s latest flying form is still in testing. Developed by Moller International, the three-wheeled, folding-wing craft is designed to be as safe, affordable, and easy to use as an automobile. The M400 travels at a top speed of 350 miles per hour and cruises in the 200’s, achieving an environmentally friendly 21 miles per gallon on ethanol, a cleaner fuel than gasoline. Because most auto emissions occur at idle or low speeds, the M400 will produce less pollution by burning fuel more completely. The Moller company is working on more efficiency by reusing the exhaust to burn more completely. A (tethered) test facility is being built at the Milk Farm Business Park in Davis, California. Moller has a contract to create a lake at the test area, but in preparation for that work they have had to lay out future roads, remove fences, buildings, etc, in order to utilize the excavated material from the lake bed efficiently. Most of that has been done and the goal now is to complete the lake before the rains start. Oh, what it takes to develop a hot new gadget. SPECIAL NEWS --- YOU COULD HAVE BID AND BOUGHT THE FIRST SKYCAR ON EBAY!! BUT YOU MISSED YOUR CHANCE. THE AUCTION CLOSED ON OCTOBER 19TH - WITH 95 BIDS - BUT NO ONE MET THE RESERVE PRICE. THE TOP BID WAS $3,000,100.00. MEET THE RESERVE AND YOU STILL MIGHT HAVE A CHANCE. 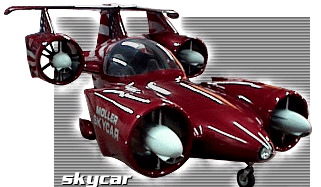 To learn more about this hot new gadget, the M400 Skycar prototype, please visit THIS HOT NEW GADGET. The price tag to you, right this minute for this hot new gadget: a mere $3.5 million. But, put in an order for delivery of 25-100 Skycars, that are not built yet, and the cost for this baby drops to $995,000 per. Now where else can you get that kind of savings on such a hot new gadget gift! The cherry-red Skycar sports eight 150-horsepower rotary engines, and four bulging nacelles, two front and two rear. It's the brainchild of Paul Moller, who holds more than four dozen patents, including some pertaining to the early UFO-esque models. He's put 40 years of sweat and more than $200 million of his own money into its development. Compare that cost to development of the V-22 Osprey, the military failure, which clicked in at $1.2 billion. 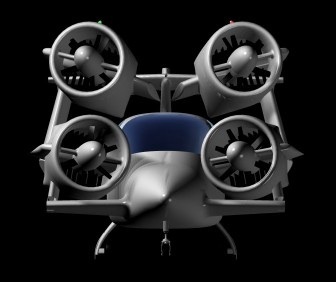 This hot new gadget gift’s initial applications, says Moller, would be military, running medevac and intelligence missions, and displacing the helicopter, which tops out at one-third the Skycar's speed and covers only half the distance. Once the hot new gadge is FAA-certified - no later than Dec. 31, 2008 (or you get your deposit on your order back) - it will be put to work for civilian law enforcement and emergency scenarios. Looking further out, when annual production eclipses 100,000 units and the price per drops to a more interesting $50 grand, it will be the ultimate traffic-buster, and a much more affordable hot new gadget gift. "By then the Skycar will be fully computer automated, plying predetermined paths along three-dimensional highways in the sky, guided by supercomputers linked to GPS satellites and geostationary systems. “Vertiports” will pop up everywhere, with Skycar buses waiting on demand or coming to fetch you like a taxi. They are even working on instant weather reports through Sirius satellite. 'Think about it,' Moller says. 'You make a phone call and a few minutes later, a pilotless Skycar lands in front of your house. You get in, punch in your destination, and off you go, free to read a book or admire the scenery. NASA's Langley Research Center, which is currently designing a "Highway in the Sky" infrastructure to support personal flight, believes Moller's Skycar "will do for car-based society what the car did for horse-based society. It is the right solution at the right time...It is not a question of if but when the market for Moller vehicles will be about $1 trillion a year." Not much comparison, but if you can't wait to spend $50k (today $3.5 Million), want to beat the rush to the skies, and don't like passengers, the AirScooter might be more your bag. In 2002, Popular Science named the ultralight personal helicopter the "Best of What's New in Aviation and Space." It's in the final phase of production and will be available next year. AirScooter II: Chopperlike vehicle capable of reaching an altitude of 10,000 feet. TRAINING REQUIRED: Takes about a day to learn. Since the FAA classifies it as anultralight vehicle, no license is necessary. EAGER CUSTOMER: U. S. border patrol wants some for recon. MAIDEN VOYAGE: A spin around the block; land in a neighbor's pool. BABE-MAGNETISM: Slightly cooler than a propeller beanie. BIGGEST BUMMER: No laser-guided missiles.